This article features a family of innovative intersection designs called “Thru-Turns” – which includes Thru-Turns, Bowties, and Michigan-Lefts. Virtually none in existence are great place-makers, but they have untapped potential. Can the tortoise win the race? Watch the video before reading this article, or read Innovative Intersections. Please comment or share with anyone who might care. Or you can contact me privately to learn more. Have you ever tried to turn left from a parking lot onto a busy arterial, and found it so impossible to get a gap in both directions that you instead went right, then made a U-turn? A Thru-Turn simply formalizes this action. In these diagrams, some lefts are completed as “Right-U-Thru.” Others are “Thru-U-Right.” Bowties, Loons, Median-U’s, Superstreets, and even roundabouts can generally be included as part of the Thru-Turn family. 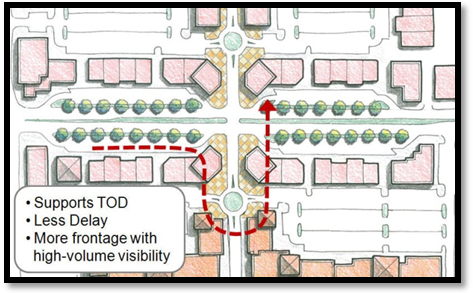 Without lefts, the main intersection has fewer conflicts, making it safer for pedestrians. With no need for left turn pockets, former pockets can serve for pedestrian refuge, transit, or other uses. This concept is also known as a “Michigan Left.” Decades ago, Michigan required a number of state highways to have very wide medians so that these U-Turns could occur. 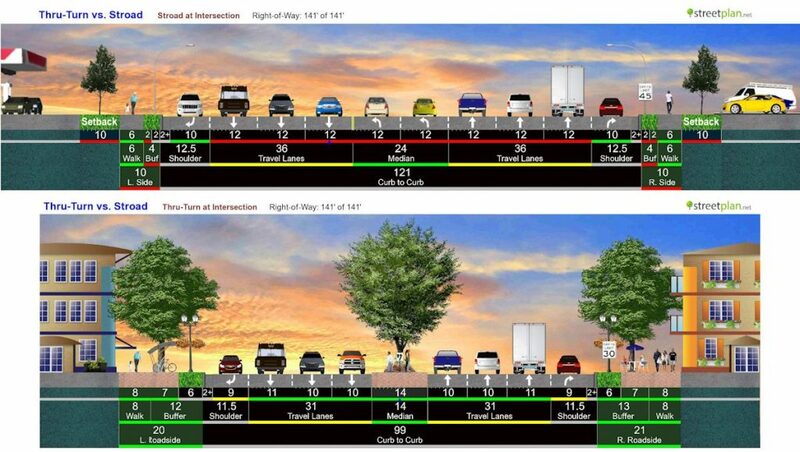 Other states lack wide medians, but often do have deep setbacks and under-utilized parking where ellipses, bulb-outs, or roundabouts could be carved out without excessive impacts. Ellipses & roundabouts create interior space which can be used as a transit station or gateway landscaping helping define a “Place.” They also help calm traffic before it enters a pedestrian-oriented space. In the above diagram, imagine if it were a typical stroad (a 7-lane arterial crossing another 7-lane arterial, with double-left turn pockets on each approach). Pedestrian Purgatory! This Bowtie design can replace that, improving walkability and livability. The ellipses redirect left turns as “right-U-thru” or “thru-U-right,” and also serve to calm traffic. Space inside the ellipse can be used for landscaping, a transit station, and to define the entry to a key “Place” in the community. Former left-turn pockets become pedestrian refuge as shown. Consider the cross-sections below. The top is the stroad version. The bottom has the same through lanes and more overall ability to move traffic with less delay, but double lefts were converted to a more narrow planted median with pedestrian refuge, narrower lanes, and a fantastically better pedestrian realm. 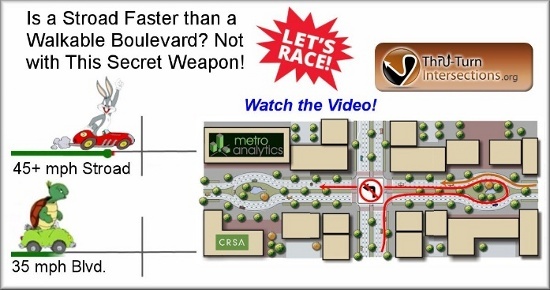 It is slower-yet-faster, safer, prettier, and less intimidating for pedestrians than it was before, and reinvestment in mixed-use development can start to occur. 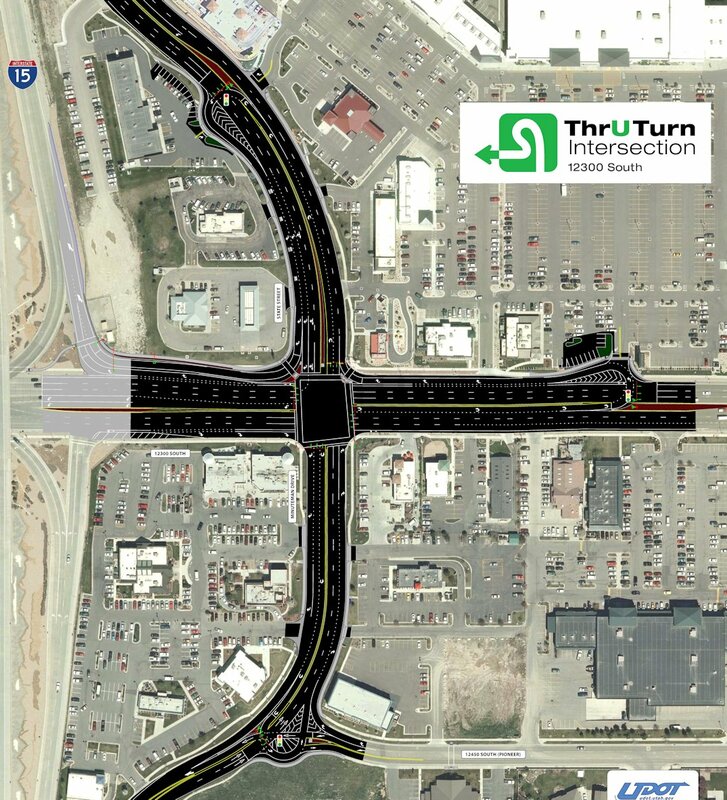 This was Utah’s first Thru-Turn, a 3-leg design that opened in 2011. It eliminated congestion (2-minute average to 26-seconds). Unfortunately there is no pedestrian refuge, no landscaped ellipses, and no lower speed limit or other place-making features. Community reception was mixed. They liked reduced congestion, but hated confusing, out-of-direction paths. Lesson: This design has big negatives in the public mind, but you can counteract that at least in part by tapping the place-making potential. It’s especially important to do this on your first one, or you may not get to build another one! Planted medians, access control, circulation. ThruTurnIntersections.org has a collection of existing locations (not comprehensive), along with videos, articles, and other links. Please comment on or ask questions about Thru-Turns and Bowties! We need to hear more from everyone who cares about urban streets if we’re to discover how these ideas can really help.